The Neuschwanstein is a castle of paradox. It was a very controversial building at its time, and there are many interesting facts about it. Here we will list some of these facts about Neuschwanstein. Neuschwanstein means “New Swan Stone”. The name of the castle derives from one of Wagner’s opera’s character, the Swan Knight. The Neuschwanstein castle was built for only one person – the King Ludwig II. Neuschwanstein is so immense though, that in some days it is visited by up to 6000 tourists. Ludiwg slept only 11 nights in the castle. Ludwig was Richard Wagner’s patron, and many rooms of the castle were inspired by Wagner’s operas. Even so, Wagner never had a chance to visit the castle as he died before it completion. The castle is one of the most photographed buildings in the world, even if photography is not permitted inside of the castle. There is no throne in the castle, as the Throne Hall was not completed before Ludwig’s death. The Sleeping Beauty Castle’s design in Disneyland was inspired by Neuschwanstein Castle. Fourteen carpenters worked for more than four years to make the woodwork in the bedroom. Despite its medieval look, it was built in the 19th century, and it served no defensive purposes. The plans of the castle were drawn by Christian Jank, a theatrical designer. In 2012, the Neuschwanstein Castle appeared on a €2 commemorative coin. 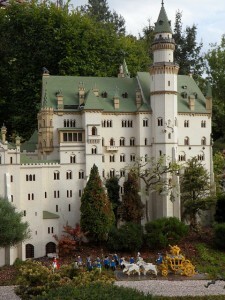 The Legoland in Günzburg features a Lego replica of Neuschwanstein. The replica is located less than 150 away from the original.